A wide variety of product options were available for visitors to try out. This year has seen the range of products offered by the associated Moseley group of companies extended massively and to encourage its customers to take a look at what is now available Moseley Distributors is inviting them to visit its Glenmavis premises over the next few weeks and try them out, including the opportunity to drive them. MD, Jim Tweedie, believes that few Scottish operators have yet experienced the Iveco Daily Sitcar Voyager, Indcar Next bodied Mercedes-Benz Atego, MAN RR2 Beulas Cygnus or Scania Van Hool and though most will by now have seen the VDL Futura 2, it is a package that offers a level of flexibility that makes it difficult to beat. Earlier in the year I looked at the first 10.5-tonne and 12-tonne Indcar Next bodied Mercedes-Benz Ategos to arrive in the country (Issue 1342, 28 August 2015). 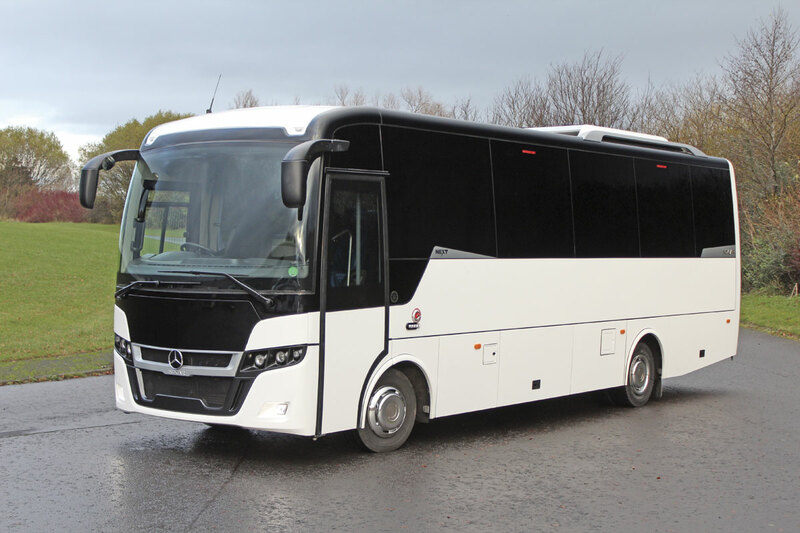 Moseley Distributors is offering both versions and examples of them were available for inspection, though the 10.5-tonne model, equipped with 33 seats, had been sold to Marbill Coaches of Beith. This 8.66m long coach had the 211hp/155kW Mercedes-Benz OM934LA four-cylinder, 5.132-litre engine and manual gearbox. Longer, at 9.39m, the 12-tonne Next shown incorporated a new option in the form of a centre continental door rather than a rear parachute door. In this form it offered 35 seats trimmed in an attractive blue patterned moquette. A manual gearbox was matched to the six-cylinder 7.698-litre Mercedes-Benz OM936LA engine, delivering 238hp/175kW at 2,200rpm and torque of 1,000Nm at 1,200-1,600rpm. Jim believes people like the thought of a full seated coach with no toilet that can offer two exits and has ordered stock with this layout to test the specification. He told me that another option was the mid door, 33 seats and a toilet. He also revealed that, ‘We are looking at the possibility of a nearside centre door DDA acceptable version too. It is not yet clear whether this can be achieved but DDA definitely can’t be done with a front door only layout because of the Atego’s front mounted engine. Jim has had a good reaction to the Next. He had anticipated that the 12-tonne would be the more popular of the two with his customers but the early reaction is that, while there is considerable interest in the bigger option, it is the 10 tonne 33-seater with rear parachute door that will be the more popular as a replacement for the Vario. One advantage he sees over the Vario is the greater luggage capacity that makes it suitable for a wider variety of roles. The retail cost of a standard 37 seat 12 tonne Atego with rear emergency door is £157,000. 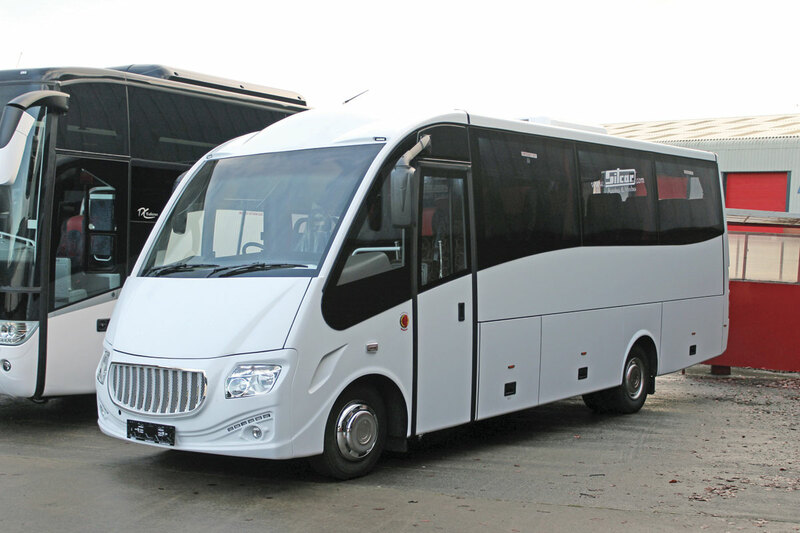 There is a long association between Moseley Distributors and the Italian Sitcar coachbuilding concern with the earlier Vario based Beluga and, to a lesser extent the Atego based Marlin, popular with Scottish and Irish customers. The Daily has never been as widely admired by UK independent operators as the Mercedes-Benz Sprinter and Vario but the fact that there really isn’t anything else you can buy in the coachbuilt 25 seat market should not detract from the fact that the 7.2 tonne GVW Sitcar Voyager bodied Daily 70C17 is an attractive little coach with much of the same appeal that the old Beluga delivered. Two examples were present, and the one I inspected had 25 three-point belted Sege recliners trimmed in maroon patterned moquette with red leather headrest inserts. This trim matched that applied to the central headlining. I’ve always liked the stitched leather trim to the dash surround and the area to the right of the driver. Both vehicles had manual gearboxes along with the four-cylinder, three-litre Euro6, Iveco engine which produces 170hp (125kW) at 2,990-3,500rpm and torque of 400Nm at 1,250-3,000rpm. They retail at £125,000. Although the Beulas range includes a vast array of options, and these will all be available through Moseley Distributors, it is Jim’s intention to focus predominantly on the two axle MAN RR2 chassis range as the basis for its Beulas offerings. This is the successor to the earlier R33 chassis and features the 10.518-litre, MAN D2066.LOH31, six-cylinder engine and ZF EcoLife six-speed fully automatic transmission. It can also have a 290hp unit but whilst I’d never advocate additional horsepower for the sake of it, everyone who has driven both assures me that you want the 360hp option because it drives so well. Three RR2 coaches were displayed, two of them 10.8m long Cygnus 40 seaters with rear offside corner mounted toilets and continental doors beyond the rear offside wheels. Offering 53/55 recliners, the 12.2m Cygnus had the same 360hp engine and ZF EcoLife transmission combination. After so long specialising in Van Hool bodied Volvos it still seems quite strange to me to be talking to Jim about Scania Van Hools. He has already sold four of the five stock vehicles ordered for this year and told me that customers have been delighted with them, reporting good fuel economy of between 10 and 11mpg. 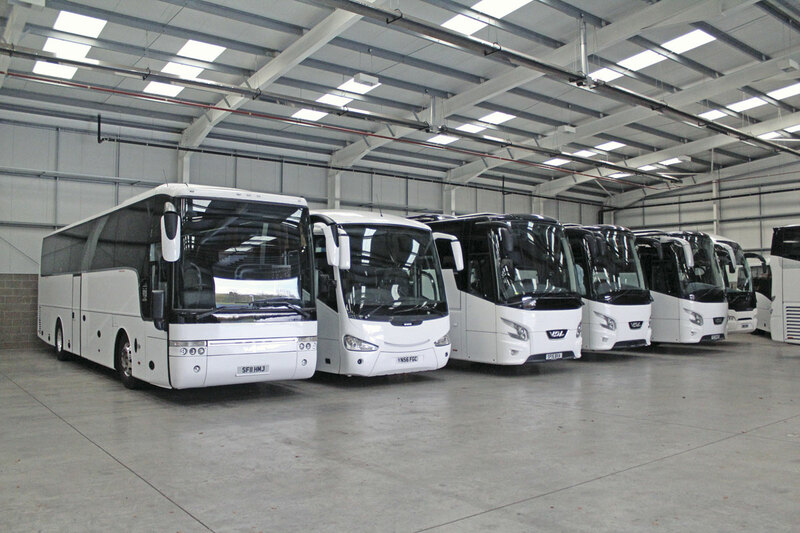 On display was a stock white 12.2m coach with 51 seats and a centre toilet and what Jim described as ‘all the toys’, including leather headrests and SatNav. Mechanically, it had the six-cylinder 410hp engine (rather than the alternative five-cylinder unit) and Opticruise automated manual transmission system. It is perhaps unfortunate that only the 12.2m two axle model is being made available for the time being, though as Jim finds very little demand for tri-axles in the Scottish market it should not prove too great a problem for him. 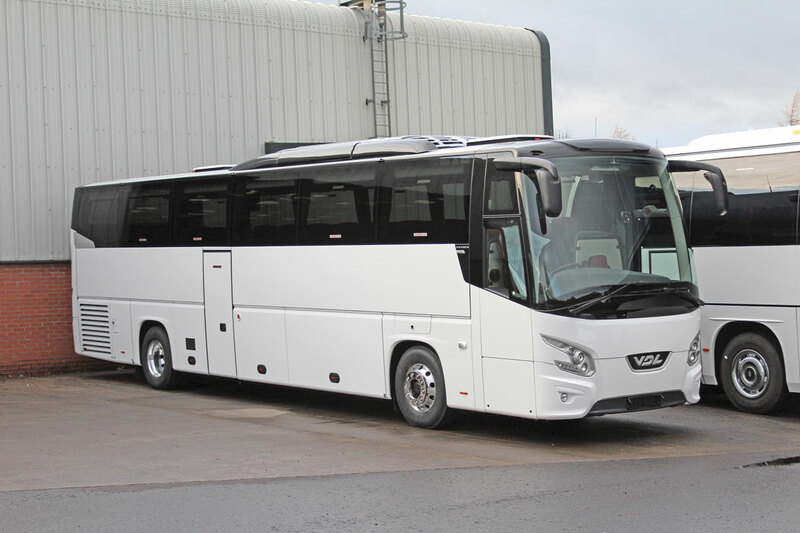 Moseley are also now offering DAF/Paccar powered Van Hool integrals and although no new examples were displayed, Jim has already taken his first order for one to be built next year. It is a TX17 Acron to a rather unusual specification to match the requirements of the Across Trust. 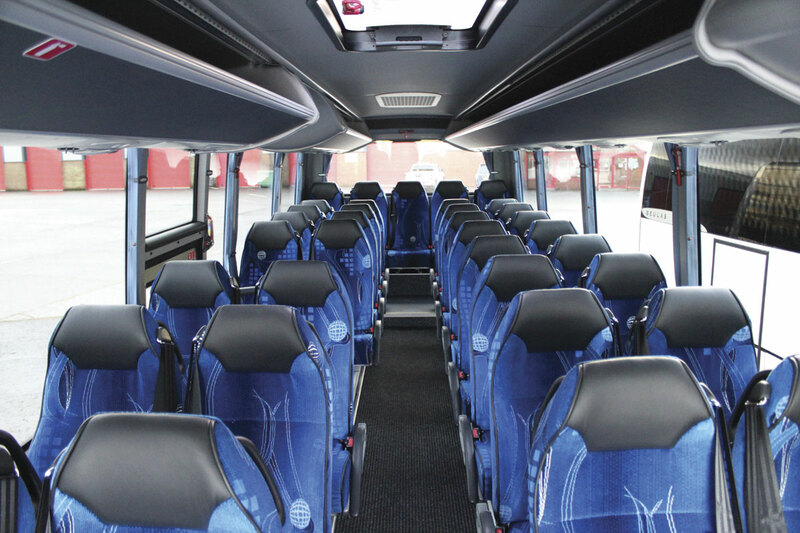 Fitted with the MX13 engine, the specification is similar to an MAN powered coach supplied three years ago which includes seven beds and seating for crews and helpers. A number of other quotations for Van Hools are also with customers. Far and away Moseley Distributors’ best seller is the VDL Futura 2 range which has accounted for more than half of this year’s sales. Representing the marque were two two-axle vehicles, both fitted with the Paccar/DAF MX11 370hp engine and ZF EcoLife fully automatic transmission. The shorter of the two was a 12.2m coach with 53 recliners trimmed in half leather, toilet, alloys and loading lights. Similarly trimmed seating for 57 people was provided in the 12.9m alternative which had all the same equipment and a few more features too. Jim finds the 12.2m more popular in Scotland because there are so many places where it can get in and out easily but the longer wheelbase 12.9m struggles. Despite this he always keeps stock of both length variants. As with Beulas and Van Hool he doesn’t stock tri-axles because there is so little demand for them on his patch. He is, however, happy to supply them to order. The company does not hold vast quantities of used stock but what is on offer is presented to a very high standard. 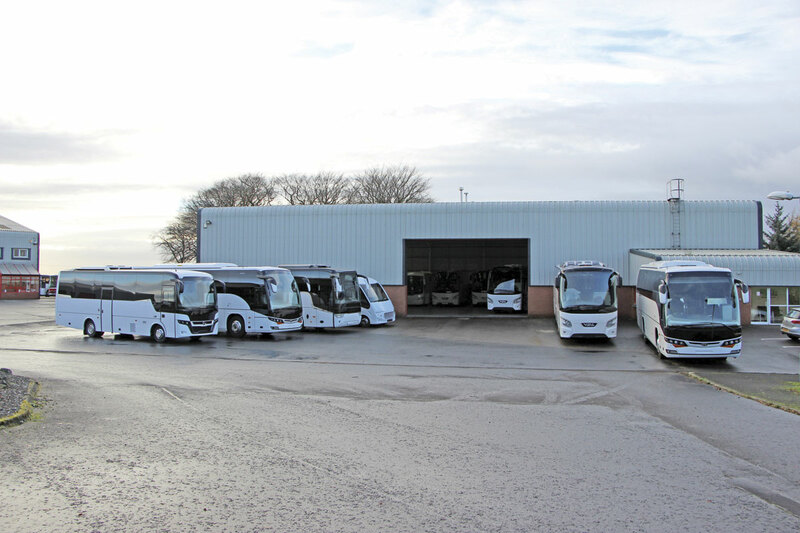 Among those in stock were: two 2012 Neoplan Tourliners, both 12.2m long though to different specifications with either 53 recliners and no toilet or 49 seats and a toilet; a 56 plate Scania automatic Irizar Century with 49 retrimmed recliners and a centre toilet; a 2011 Van Hool T915 with MAN 410hp engine, centre toilet, 51 recliners and drop down monitors; a 2010(60) Mercedes Benz Sprinter with Excel coachwork, 16 leather recliners and two tables; and a 2003 Volvo B12M Plaxton Paragon with 50 recliners, a rear saloon toilet, air conditioning and a new MOT and tyres. All but the Sprinter were repainted white. There were also a small number of older coaches, including some very well presented for their age. He admits that it has been hard to recover from the untimely passing of Alistair Wilson in January 2014 but the team have risen to the challenge and hopefully customers will not have seen any difference in the service provided. 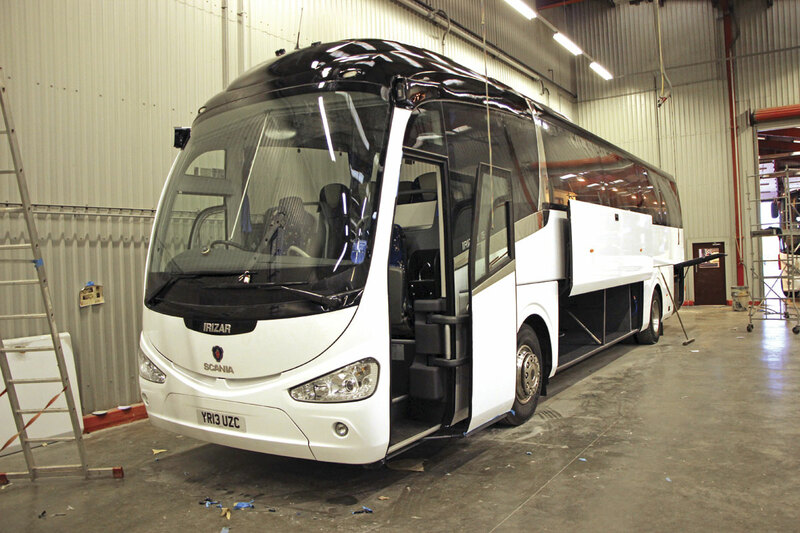 The business has always undertaken a lot of major accident repair work on coaches of all types, providing the parts can be obtained. This now forms the major part of what the workshops do. Such is the team’s reputation that jobs come in from all parts of the UK including London and the South West. Jim had a jig straightening system installed within the floor when the building was erected 20 years ago. Recent jobs include rebuilding the front of a Cheetah, the front end of a Futura FHD2, replacing the front of a Futura Classic all the way back to the front seats and replacing the stretched panels on the top deck of a double deck coach. They are just as happy to undertake lesser tasks such as reflooring, the only thing they don’t do being retrimming, which is sent to Eastgate. They don’t take longer than they need to either: I was told a Futura that came in on the Friday of the week before my visit would be finished and out by the following Tuesday. An unusual recent conversion was to a pair of 14m Bova Futura Classics with the four over four ZF 8S.180 manual gearbox. 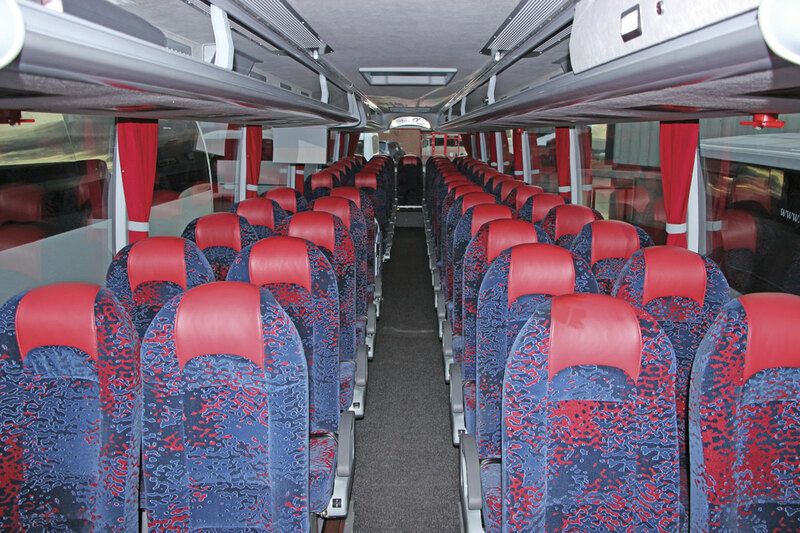 Originally fitted with 63 seats and no toilet, the flat floored vehicles have been upseated to become 80 seaters in a conversion that required the installation of an additional box section from front to rear in order to provide a third mounting point. 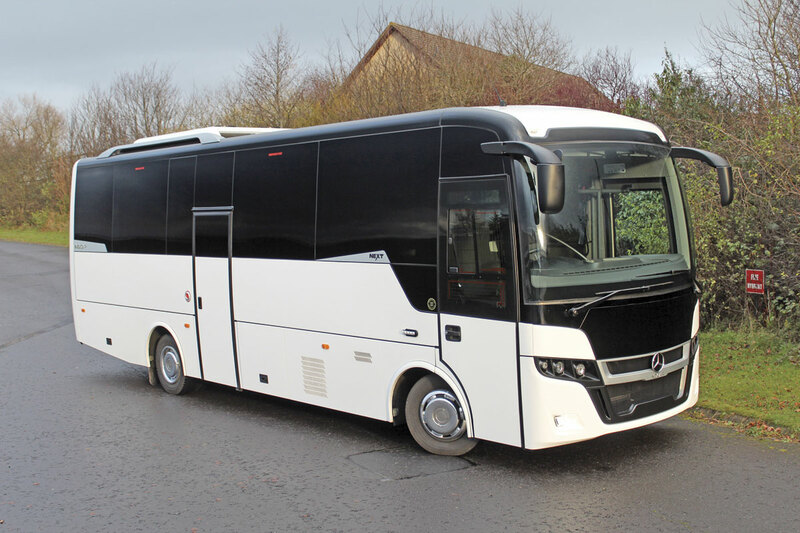 They were well within the weight limits with over a tonne left for luggage, indeed they could have been equipped with 85 seats had the customer, Allen & Black of Aboyne, needed that capacity. ‘They looked a treat,’ said Jim. 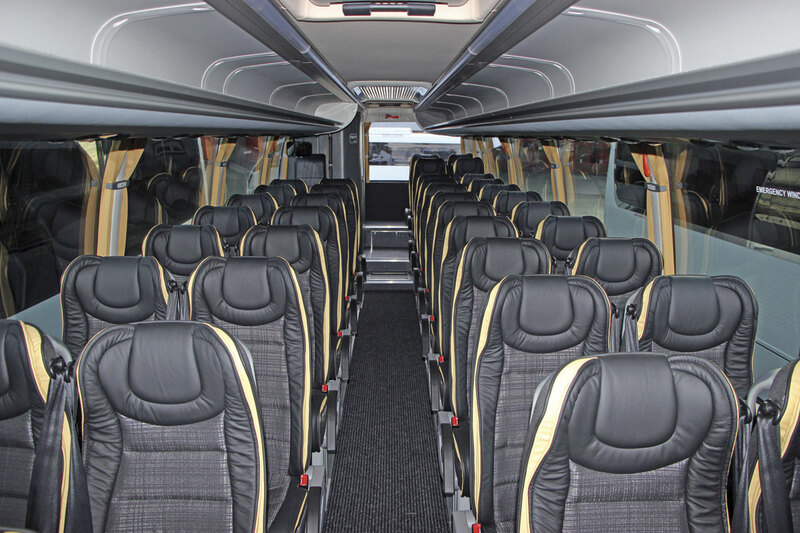 Selling coaches is a business that has changed a lot in recent years with business rationales and motivations less clear cut than they once were. Jim Tweedie has also sought to sell good products, offer service to match and in the process sought to make a profit that has enabled him to reinvest to continue investing in the business to meet the needs of a changing market. With less operators and a smaller overall market, the 60 to 65 units a year he once sold now seem a distant memory but now that the total is under half of that he has not compromised on his approach to providing quality service and he has no intention of doing so.